It's a lovely fall evening here in Greece and it is time for me to kick off the first of many surprises that I have planned for this blog. Today I have another giveaway for all you lovely ladies (and maybe gentlemen?) who read my blog. All these goodies are favourites of mine and can be found mostly in Japan. It includes four nail polishes and lots of nail art goodies. and fill in the name with which you follow and your email address in the form below. Also as I want to express my gratitude to the ladies who comment on this little blog of mine, everyone who has left a comment until today and joins in this giveaway will get an extra entry. The giveaway is international and will be open until October 15. On October 16, I will pick the winner and send them an email. If I receive no reply within 48 hours, I will pick another winner. All the items included in this giveaway have been purchased by me. That was all from me for now, I hope you like the goodies I have selected. This is really nice of you!!! I normally don't linkspam, but since you asked... http://never-unpolished.blogspot.com :) Thanks! Yay!!! :) Wow you're in Greece?? Me too!! :) Do you live here permanently? Thank you so much everyone for your sweet comments both here and on the contest form. It makes me so happy reading them. I will try to reply properly as soon as my injured hand gives me a break. The one who wins this will be so lucky! I am from France... I can? I am going to make as a giveaways Japanese / France very soon, but little different of your, special nail Japanese art, and as the other presents!!! Thank you very much for your "Giveaway", it is very generous to you! je suis de France...Je peux? 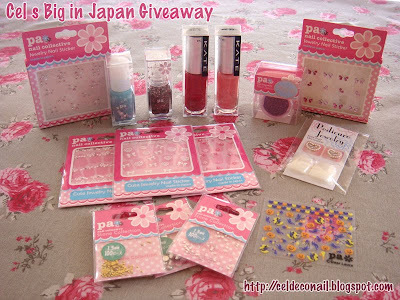 Je vais faire aussi un giveaways japonais/France très bientôt, mais un peu different du votre, spécial nail art japonais, et aussi d'autres cadeaux!!! Vous verrez votre article sur le coté droit de mon blog , il sera affiché en permanence jusqu'à la fin du jeu! merci pour votre "Giveaway" , c'est très généreux à vous! Im your follower from Indonesia.